I stumbled upon this book on Amazon and was surprised at the beauty of its contents and the message is perfect for this blog! I have already ordered one and will let you all know how it is, when it arrives. Here is a review from and Amazon reader. “French America” is a dazzling, oversized coffee table book which opens an entirely new world all around the reader. I had expected a treasure of great pictures and was not disappointed. What I had not expected is the narration, not only descriptions of the pictures, but of the history of the French role in the development of the United States. 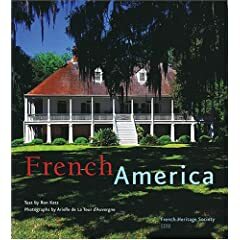 This book is a tour through many buildings associated with French settlement and development in the United States. Beginning with the early Huguenot settlements in New York and South Carolina, the reader is taken on to the heart of French America along the Great Lakes and down the Mississippi. Despite living among the greatest collection of French Colonial architecture in the country, I learned of near by structures of which I was totally unaware. The journey continues down the river to Louisiana with its living French culture amid the houses and buildings surviving from a way of life that is Gone With The Wind. The tour winds through sites in the Eastern states associated with French participation in the French and Indian and Revolutionary Wars and concludes with Civic buildings in the Washington-Virginia area inspired by French architecture. This book broadened my understanding of the French heritage around us and sharpened my appetite to visit some of these areas. It can do the same for you.